This beautiful Victoria-era mansion makes for a lovely visit. Tour guide was knowledgeable and informative. Neat castle self guided tour. We booked this last minute through the cruise. Not all of the castle was restored, many rooms were closed off. The castle is the house of a very wealthy coal baron. The castle is the house of a very wealthy coal baron. Well laid out with period settings and was well-organized. We enjoyed it. be prepared to climb five stories of stairs for the full tour. Very interesting. Not enough time at the Castle! Not enough time at the Castle! The bus has to park too far from the castle. At our age, we were already tired before we got to the castle. Our guide, Mike, was fantastic. Our guide, Mike, was fantastic. If you&apos;ve seen castles in Europe (as we have) this one is a huge disappointment. It was a beautiful castle. It was a beautiful castle. Wish we could have spent more time in Victoria so we could shop and explore the city after our tour. Not exactly a castle, but a beautiful building architecturally with astounding opulence (for its period) inside. Was a fantastic tour. Beautiful city and the castle was not only beautiful, but interesting as well. Fun to visit independently. We took a cab from the ship and had a leisurely visit. Then walked to Government House to walk thru the beautiful gardens. Then a short walk back to town. Not very interesting and surely not much of a castle and far from being with the cost! It was OK, A little pricy for what it was. It was OK, A little pricy for what it was. Tour guide was pretty dull. We are not flower people so we did the castle instead. We were the last tour of the evening, and was close to dusk when we arrived. There is a good bit of walking to get to the castle. There is a good bit of walking to get to the castle. Really neat. 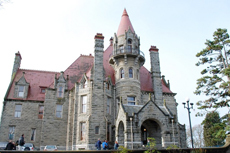 I guess a highlight of Vancouver Island but if you have been to the UK, you have seen plenty of castles with similar decor and more grandeur. Very lovely home and nicely curated. I love historic homes so I enjoyed this tour very much. For us, going to the Castle for one hour was a complete waste of time on a 2 1/2 hour tour. For us, going to the Castle for one hour was a complete waste of time on a 2 1/2 hour tour. The bus driver was very informative but the tour of the city via bus was not at all good. The bus driver saved the tour. Very interesting to learn the history of the castle. Very interesting to learn the history of the castle. Interior was very ornate. It was interesting to see how people lived and to learn a little of the history of the 25,000 square foot "home". We did this one on our own.